You know that the health of your mouth and teeth is important to you. Your smile says a lot about who you are, and without proper oral hygiene, that smile might be something that you’re embarrassed about. Taking care of your teeth doesn’t have to be a monumental challenge, though. 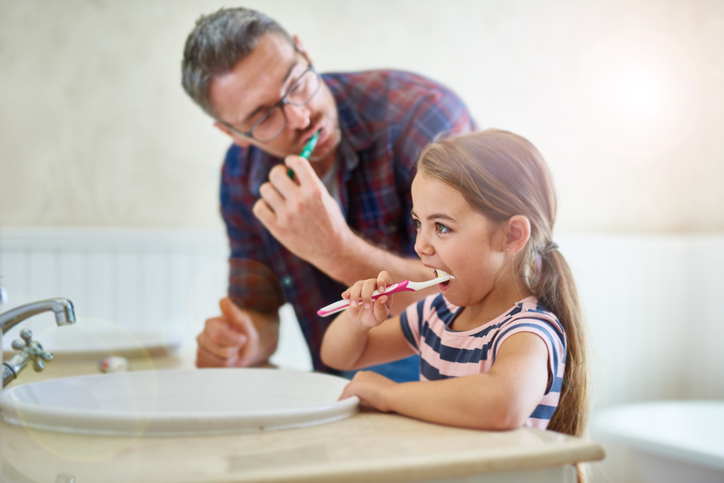 With some basic oral hygiene tips to guide you, making sure you have a healthy mouth is something you can do. Whether you’re trying to break bad habits or you just want the best possible teeth you can have, the right oral care routine can help you achieve your goal. The fact that you need to brush your teeth regularly isn’t one of the oral hygiene tips that will shock you. You already know that you’re supposed to be brushing your teeth regularly to prevent decay and keep your teeth pearly white. What many people don’t know is that brushing after each meal really is your best bet for optimal dental health. Whenever possible, you should aim to brush your teeth about 30 minutes after eating a meal, especially if it contained sugar, citrus, or other foods that can be damaging to teeth. Brushing when you’re at home should be easy, but keeping a toothbrush and toothpaste at work can make this task possible too. A small overnight bag for toiletries should fit easily into your desk or day bag at work. Some dentists will tell you that if they had to pick between brushing and flossing in order of importance, they would choose flossing every single time. That’s because flossing helps to remove food particles that can get stuck between your teeth, causing decay and plaque buildup very quickly. Luckily for you, you don’t have to choose between brushing and flossing – you just have to remember to floss. Aiming to floss your teeth after meals is a noble goal, but most of the time simply flossing once or twice per day – especially before bed – can help you maintain a beautiful, healthy smile. By combining tooth brushing with flossing, this is one of those oral hygiene tips that you absolutely must heed if you want a bright white smile and healthy teeth for years to come. Your dentist has probably told you 1,000 times that getting regular cleanings is a major key toward having a healthy mouth. That doesn’t mean you go as often as you should or that you don’t put cleanings off because they aren’t as fun as some other activities. To maintain a beautiful, healthy smile, you should be going to your dentist for cleanings approximately once every six months. If you have diabetes or other health issues, visiting more often is one of the best oral hygiene tips you can take to heart. Getting regular cleanings does more than just keep your teeth looking their best, though. They also help ensure that you don’t end up in pain or with major dental bills down the road. Taking care of your teeth isn’t an impossible challenge, and for the most part, doing it right is just about creating a routine that works and sticking with it. After all, oral hygiene tips like brushing and flossing regularly aren’t exactly new. It’s how you do it that really matters. Use these oral hygiene tips to make sure you’re taking care of your teeth. Don’t forget to make an appointment with your dentist at Central Florida Periodontics for your next cleaning either!